Boston Braves..... 1930s Original and Authentic QUAKER OATS HISTORIC, BABE RUTH BOSTON BRAVES CHAMPIONS pin. 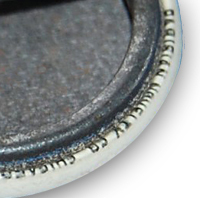 Very RARE and hard to find In VERY Good Condition (Rare for its age). 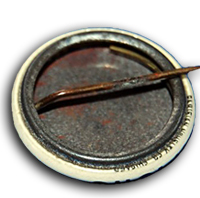 An Original 1935 Historic pin by the PARISIAN NOVELTY CO. CHICAGO, Ill. Pin measures : 7/8 inch. 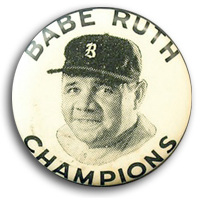 This pin is the ONLY vintage pin of Ruth when he played on any Boston team. Ruth only played for the Braves two months. On opening day he hit a home run off of famed pitcher, Carl Hubbel. On his last game EVER played, he hit THREE HOME RUNS agenst the Pittsburg Pirates , and he went out with a bang. Ruth was led to believe he was to be given a shot at manageing the Braves, but was not. The look on Ruth's face on this pin tells a story of pain and hardship. May 30, 1935 was the last game the Babe played, it was with the Boston Braves.